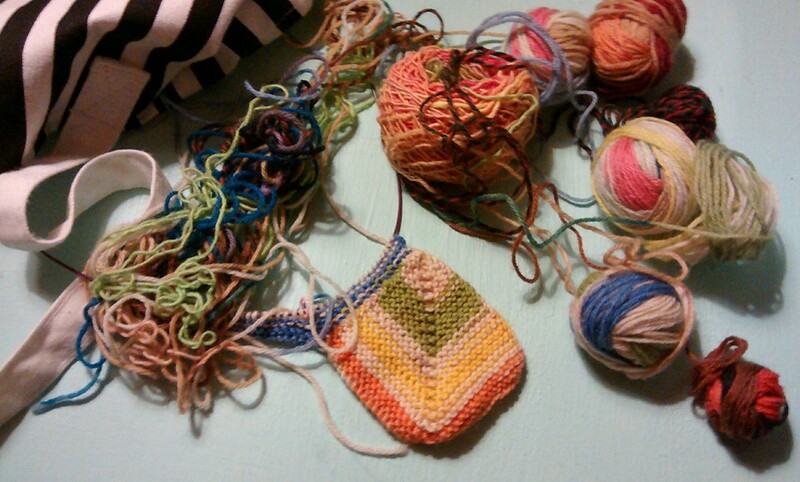 Remember how I learned to make a mitered square in knitting class on Monday? And I shared a photo of my first completed square? Well, I thought I would work on the second square that I’d joined to the first one. I got my knitting bag that I brought to class, and I dumped out the contents, which included several small balls of scrap sock yarn. And discovered this. Some people might have the patience to unravel this mess, but I don’t have that patience. Life is too short. I’m getting the scissors. Categories: Handmade | Tags: knitting, scrap yarn, sock yarn | Permalink.